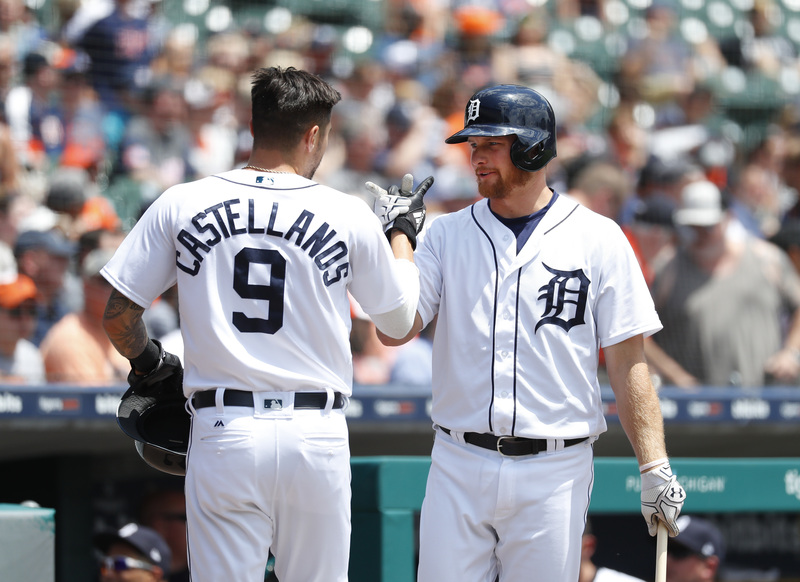 DETROIT (AP) — Ronny Rodriguez had a memorable major league debut, hitting singles, scoring a run and making plays at second and third base to help the Detroit Tigers beat the Los Angeles Angels 6-2 Thursday. The Tigers called the 26-year-old Dominican infielder on Wednesday night after he hit for the cycle, playing for the Triple-A Toledo Mud Hens at Syracuse. He woke up at 4 a.m. Thursday in New York to fly to Detroit, where his mother and girlfriend were among his fans in the stands. “He won’t ever forget it,” Tigers manager Ron Gardenhire said. Victor Reyes hit a three-run triple in the five-run first, and the Rule 5 draft pick from Arizona had his first multihit game. He entered the game hitting just .139 while playing sparingly. “I’ve got to get him more at-bats,” Gardenhire said. Detroit starter Ryan Carpenter was on pace to pick up his first career victory, but left the game after four innings with an oblique strain and was sent to the disabled list after the game. Warwick Saupold (3-1) replaced Carpenter and pitched two perfect innings. Carpenter gave up one run and five hits. Andrew Heaney (2-4) allowed five runs and eight hits over five innings. He had given up a total of six runs over his previous six starts. The Tigers set themselves up to win the four-game series by roughing up Heaney in the first inning. Jeimer Candelario hit an RBI double, John Hicks drove in a run with a single and Reyes’ triple later cleared the bases to make it 5-0. Jose Briceno hit a solo homer in the fifth and Mike Trout hit an RBI single in the eighth, pulling the Angels within four. The Tigers had a goose decoy in their dugout and Dr. Catherine Roach to throw out the ceremonial first pitch . The veterinarian helped a real goose get out of the ballpark safely during a game the previous night. Shohei Ohtani was not used as a hitter in the series finale, following the Angels’ plan to usually let him rest the day before or after he pitches. He allowed one run and three hits in five innings Wednesday night. “We’re trying to err on the side of caution,” Sciosica said. Angels: Zack Cozart (forearm tightness) was a late scratch from the lineup on Wednesday and Sciosica said the infielder felt a little better Thursday morning. “I hope it’s not serious,” Sciosica said. RHP Blake Wood, who had elbow surgery Wednesday, is expected to be out for 12 to 14 months. Tigers: Slugger Miguel Cabrera may play Friday night at home against Toronto after missing nearly a month with a strained right hamstring. “There’s a good chance he’ll be activated,” Gardenhire said. Home plate umpire Marty Foster’s facemask was hit by a foul ball in the third inning, stunning him and sending him to a knee. After being evaluated on the field and staying in the game, he walked off the field and toward the umpires’ dressing room a few innings later. Greg Gibson went from second base to working behind the plate. Angels RHP Jaime Barria (4-1) and Texas RHP Bartolo Colon (2-2) are scheduled to be on the mound Friday night when Los Angeles returns home. Tigers LHP Blaine Hardy (1-0) and Blue Jays LHP Jaime Garcia (2-3) are the probable pitchers Friday night in Detroit.